This month’s issue of The Wire takes an edgy view of some composers’ egos and from this leads into a mention of “The Set”. I have selected extracts from what is quite a substantial feature by Philip Clark which includes two other composers. If you wish to read the complete article go here: http://thewire.co.uk/in-writing/columns/philip-clark_check-your-blind-spot. “Composers need to feel the love hard and often. They need you to understand that their work is important and why. Paranoia and delusions of self-grandeur are an accepted occupational hazard. The world of modern composition is like grubby party politics: a dirty, self-serving, are you with me or against me, self perpetuating racket that has sucked in more than in its fair share of unhinged egos, bores with nothing to say and narcissistic shits. …But there’s a difference between music that is hardly there and music that doesn’t even want to be noticed. Some music allows itself to be composed only grudgingly – how did it come to this, you hear it ask; or, to put it another way, a certain type of composer holds composerly egos in such contempt that anonymity is the only avenue left open. A recent release on the Metier label made little sense until I twigged that the composer of Set for Piano has tried to reduce his own identity to a footnote. 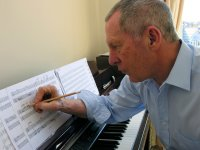 Eric Craven gives himself equal billing to pianist Mary Dullea – who ‘realises and performs’ his piece. Set for Piano is an anti-title. It is the pianist’s job to decide about tempo and dynamics; even in the final piece to shape phrase structures from out of Craven’s freeflow of notated material. The music’s untreated, naked tonal gestures are oddly timeless, leaving you guessing about when the piece was written – questions that are left stubbornly unanswered. Anonymous minds aren’t likely to give accounts of themselves and Craven’s motivation is left tantalisingly hanging….